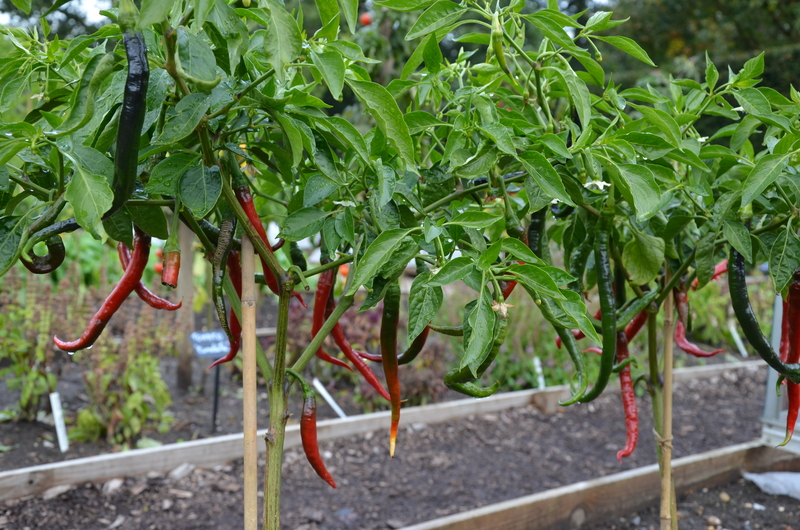 So called because the slender red peppers grow to as much as 30cm in length, this is Joe’s Long a Cayenne Chilli originally from Italy. As a plant it also grows taller that other chilli varieties, hence the bamboo staking you can see in the picture below. These are optimistically planted outside which why they are only just ripening but grown under glass or in a greenhouse they would crop in June or July. The heat level is medium hot, they dry well or can be used fresh in any recipe where chilli is specified and of course there is always chilli vodka. Seeds available from Victoriana Nursery Gardens here and if you click on the ‘Useful Stuff’ tab there are some very good videos about cultivation. Photograph taken at RHS Wisley yesterday morning. Thank you David. I’ve never made it but will do some research and rectify that situation so yes, post to come.